An eight-seat car pulled over by police in Suffolk was being driven with 15 people on board - including two in the boot. 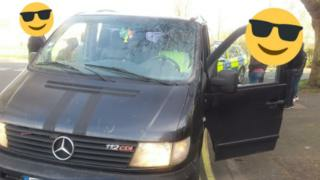 The Mercedes people carrier was stopped by officers in Ipswich on Saturday. Norfolk and Suffolk Road Policing and Armed Officers Team put out a tweet. The driver was reported for a number of offences and a prohibition order placed on the vehicle "due to a number of defects", meaning it cannot be driven, police said.